Steve Frame’s grandfather, John Martin, with his service truck. The two little girls are Lois Findley (with the cat) and Steve’s mother Evelyn. Whether you want a big screen television installed in your family room or you want a luxurious dedicated home theater room built into your new house, you don’t have to search around for the best company to do the work, it’s right here in Cedar Mill. Cedar Mill Home Theater has the capability to handle any job, from installing low-voltage wiring systems in new construction or just updating your current entertainment system. Steve grew up on the family farm. 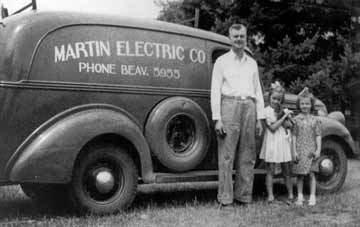 Steve’s father, Bill Frame, learned the electrical business from Martin and worked for Martin Electric all his life. He had Steve “fishing wire” through walls and into attics as a teenager, and took out his apprenticeship papers when Steve turned 19. But Steve told his dad that he had better things to do with his life. He never strayed that far from the electrical business, though. He worked at Jafco, a large audio-video retailer in downtown Portland during the 70s, and also worked at the Paramount Theatre (now the Schnitzer Auditorium) setting up for live music concerts. In the 80s he sold equipment at Stereo Super Stores. He was working as a sales person at Uptown Audio Video at Cornell and Joy in 2005, when the owner decided to shut down the business. 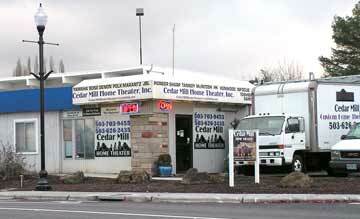 Steve felt that the time was right to start his own company, and he kept the customer records and started Cedar Mill Home Theater in that location. About half of the business is installing systems in new construction. New homes can be wired so there are outlets available in every room for integrated phone, computer, audio/video and security systems. He works with contractors building homes “on spec,” and also with people building new homes for themselves. 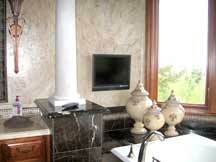 “It gives the homeowner a lot of flexibility in the way they can use their rooms,” Steve says. Cedar Mill Home Theater can provide everything necessary for a complete home theater, including the electronic equipment, home theater furniture, and advanced control systems. “We work with a couple of subcontractors to provide finish carpentry, sheetrock, and carpeting so you get a complete installation,” he says. “Denon has a new system that includes a WiFi and network capable receiver that lets you download shows off the internet and watch them on your bigscreen,” he notes. Integrating computer systems and entertainment systems is just one of the new technologies that Frame has to keep up with. “I had to give up salmon fishing so I could keep up with the technology,” he laughs. Blu-ray and high definition video are a couple of important new technologies that are gaining popularity. Almost all of the new video installations he does are high-definition. 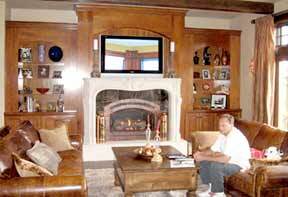 He installs both LCD and plasma screens, but he says that LCD is far better technically. “It’s the best for angle viewing, it lasts about twice as long, uses less power, and runs cooler. It costs more, but you definitely get a good return on your investment,” he says. 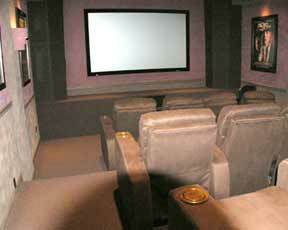 A basic home theater installation can be done for around $5000, but getting all the bells and whistles can run as much as $100,000. “Customer service is what makes my business work,” Steve says. “People want their systems to be easy to use, so good planning and working with the customer is essential. 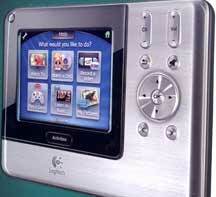 When you’ve got five or six components in a home theater, you want a properly programmed universal remote,” he says. He gets a lot of his business from satisfied customers recommending him to their friends. Most of their customers are local, in Cedar Mill, Bethany and Forest Heights. Steve loves that he doesn’t have to spend a lot of time driving around the area. He lives nearby off of Burton Road where his wife raises Arabian horses at the family farm where she grew up as the eldest daughter of Tom Hartung, the late state senator. His mother has her own apartment in the same house. For more information about how Steve and his crew can help you get the entertainment system of your dreams, call 503-626-2435 or stop by the showroom at 13405 NW Cornell.